Is he ready to help keep the realm safe? He's a brave knight! You always knew that he would be. (He was raised right, after all!) But now that he's come of age, you can be expecting a call from the king himself any one of these days. Because when word gets to the high castle that your boy is ready to do his part for king and country, you can expect that he's going to go into the service of knighthood in very short order. There are dragons to slay, after all! Now, he might be a bit nervous about being knighted, having some stuffy old man waving a sword around his head, but trust us, he'll be fine. At the worst maybe he loses and ear or two. A small price to pay for knighthood! 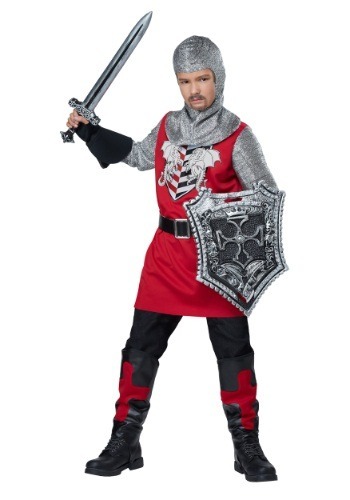 This costume is sure to have him feeling like a knight who can battle the evildoers in the realm, or at the very least, slay a dragon or two! A detailed ensemble look means that he'll have the perfect style for riding his trusty steed at the jousting court, or the dashing style to strut up the dangerous mountain path to the dragon's lair. There's always the chance that dragon is in the mood to barbecue some knights though, so we always recommend he ride in the middle of the pack. Or, if he's feeling especially confident, ride at the front, next to the king! Kings usually survive that stuff, right? Well, time is a wasting! Duty calls! Don that armor and ride into battle, knight! Very happy with this costume. It’s just a shame that the sword and shield can’t be shipped overseas.